So, what is this fascination with text-based stuff? Efficiency? Dislike of the artistic? Enjoy typing? That’s an excellent question. I don’t use very many text based apps on a daily basis, I like Pretty as much as the next Enlightenment user, but they can be a lifesaver at times. Being able to connect to a machine I own from a text based terminal from anywhere in the world essentially gives me access to a full suite of internet applications. 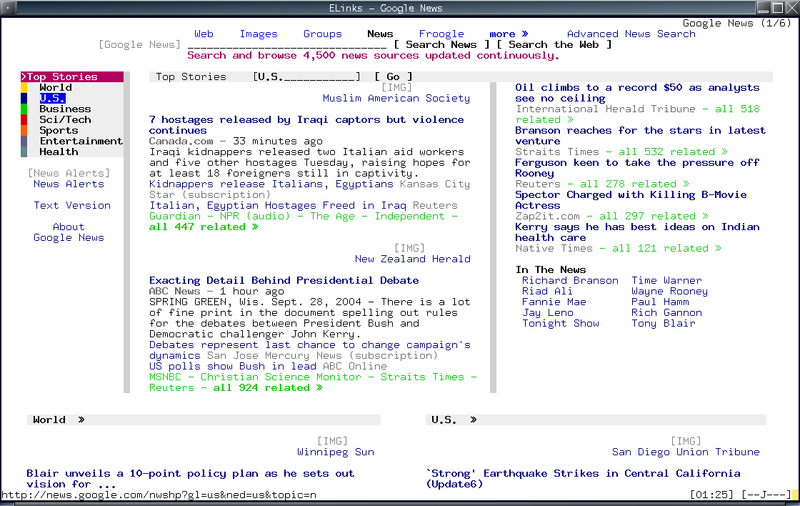 eLinks is a web browser. With that I can look up anything I need to, any time, any place, using MY browser, with MY bookmarks etc. Screenshot here. Pine I use all the time, simlpy because it’s a great email application. It’s blazing fast, super powerful, and again, I can access it from anywhere. So the long and short of it is that I keep them around in an emergency, and the more powerful they are, the more they help my emergency. I really wish my phone were more text-based. I run a blackberry, and I like the 240px screen, but it would have more space if it didn’t have those huge icons. I could see running text-based email/chat/web browsing on my blackberry. For some reason, that screenshot reminds me of my pc-write wp program, that I used to have on 2 5.25 Floppies.